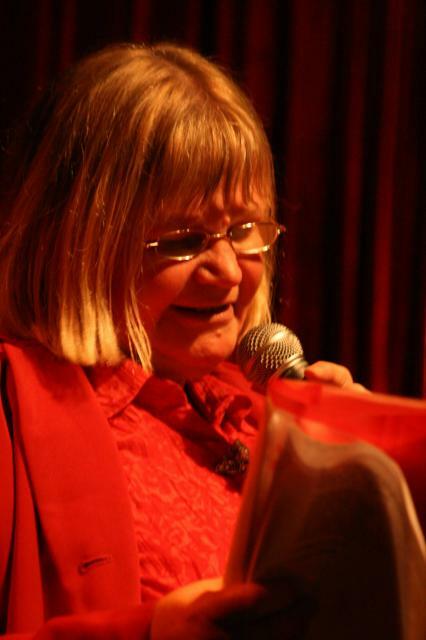 Melbourne poet Lynne Dale is the convener of the monthly Westwords poetry reading, which takes place in the Dancing Dog Cafe` in Footscray and coordinator of Williamstown Writers. Her work has been anthologised, including in The Other Side, Fences and Half Open Doors. Tomorrow (Sunday September 6), Lynne will bring artists and poets of the West together for a special Overload Westword event. Lynne Dale is the mother of three adult children and a fourteen year old grandchild, and her interview was the inspiration behind the Overland Overloaded team’s ‘poeranting’ (poetic parenting) series of posts, still to come during Overload if our children would just leave us alone and let us write. In putting together coverage for the Overland/Overload blog, I’ve noticed how few female poetry MC’s (of regular gigs) there are in Melbourne . Can you shed any light on why this is? You know – women & families go together not much time for recreation let alone regular commitments. Hell yes. Mostly it’s a chauvanistic field – men get acknowledgement whereas women talk anyway so why is poetry different. As for organising it’s what we’re built for…why skite about it. What makes Westwords different from the other poetry gigs around? 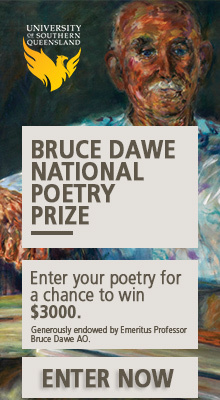 We still want to hear bush poetry or traditional poetry along with free verse. We have a valuable prize for open mic and we are environmentally friendly using tiles instead of paper for the raffle. Was that all just spin? Naturally, I have a degree in spin. Most of the regular poetry gigs in Melbourne seem to be at inner-city venues. How long has Westwords been going in Footscray, and why is it still going? It’s being going about eight years not always as Westword though, Peter Davies ran it before it became Westword. Plus it’s a brilliant venue. What’s the most scandalous thing that’s happened at a Westwords gig? Come on, you can do better than that. Trust me, my lips are sealed. So are mine. I’ve never kissed and told why should this be different. How do you pick your features for Westwords? No, seriously: can you be bribed? not the light ekphrastic but still good in a muted way. Talking and organising – very true (multi-tasking in general) – just most of the important stuff in life. Good stuff! This Overload event is actually listed under Sunday 6 in the link, but Sunday 13 in the main programme menu. We hope to get back to you soon regarding this.